At Breezway, we believe that ventilation is vitally important for healthy, naturally comfortable homes and buildings. As a result, two Australian reports have caught my attention recently due to their findings relating to natural ventilation. Recognising the growing popularity of apartment living, the Victorian Government has been working on their Better Apartments Design Standards for a number of years. As part of the development of the design standards, they released a discussion paper and then gathered feedback to better understand the relative importance of various aspects of apartment living. Public interest in the design standards was strong with over 1700 people responding to the survey, 145 submissions being received and 235 people participating in workshops, forums and interviews. Natural ventilation was ranked by survey and written respondents as the third most important issue affecting apartment living, with only ‘daylight’ and ‘space’ ranked as more important. The respondents ranked ‘natural ventilation’ as being more important than ‘sunlight’, ‘outdoor space’, ‘noise’ and ‘outlook’. Produced by the University of Melbourne for the Australian Communities Foundation Green Cities Innovation Fund, this report primarily considers the performance of typical Melbourne apartments with the majority of their glazing facing west (a worst case scenario) during heat waves without mechanical cooling, and the retrofit opportunities to improve their performance. The most interesting aspect of the report is the decision to run the modelling on 5 of the 6 apartments both with and without natural ventilation through openable windows. The report authors modelled a 4 week period in 2009 that included a heatwave period of 3 days with day-time temperatures over 40°C and night-time temperatures above 25°C, so it is to be expected that apartments with western orientations, no mechanical cooling and windows that do not open would be uncomfortably hot. Their modelling with the windows always closed showed that, on average, the indoor temperatures in the apartments would be above 25°C for 77% of the 4 week period. One of the apartments was predicted to only drop below 25°C for 2% of the 4 week period despite the outside temperatures dropping below 15°C for 7 nights. The modelling assumed that windows could open to 50%. If restricted opening devices are used to comply with the Building Code requirements for fall prevention through openable windows, then windows will only be able to be opened to a maximum of 120mm. 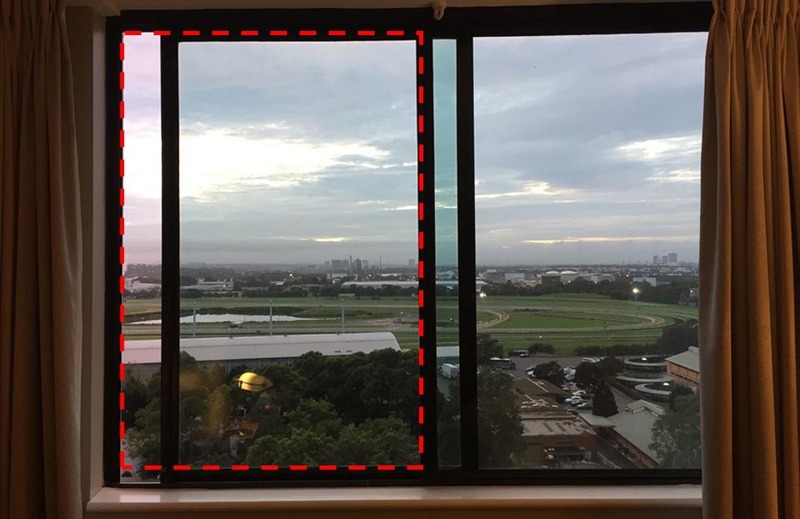 If a sliding window 1800mm wide has its opening restricted to only open to 120mm, then instead of ventilation being possible through 45% of the window’s area, ventilation will only be possible through around 6% of the window’s area. This is nowhere near the 50% assumed in the modelling and will therefore significantly reduce the effectiveness of natural ventilation resulting in indoor temperatures closer to those modelled with the windows permanently closed! Without being able to cool their apartments through natural ventilation, either because their apartment has windows which don’t open, or because they can only open the windows a tiny bit, people will simply run their air conditioners. This will keep their indoor temperatures within the comfortable range, but will drastically increase their electricity consumption, pushing up their power bills and greenhouse gas emissions. Increased use of air conditioning will also put a greater strain on the power grid, increasing the likelihood of power outages during heat waves – which is precisely when apartments could turn into ovens without good natural ventilation! Architects and building designers should pay close attention to the windows they specify in apartments. The public feedback shows that people value being able to open their windows to allow natural ventilation and the modelling shows the potential for apartments to be power-hungry at best and dangerously hot and stuffy at worst if no, or very restricted, openings are provided. With ventilation openings on both sides of each blade, the Altair Louvre Window with the Stronghold System is a great option to maximise the natural ventilation in apartments even when openings are restricted to comply with the BCA fall prevention requirements. Learn more about the benefits of using Altair Louvre Windows with the Stronghold System in Apartments here.